Q: What was Tsoknyi Rinpoche the First’s long-term plan for the Nangchen Nuns? The nuns are part of a wisdom tradition that was preserved in Tibet for many centuries. Tsoknyi Rinpoche the First (who flourished in the 19th century) designed and developed a system of practices for the transformation and enlightenment of female practitioners in Tibet. He envisioned a time when these women would become among the most accomplished Buddhist practitioners in the world. The nuns mainly practice the Nyingma tradition and Dzogchen. 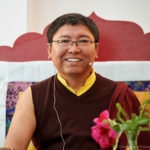 Now that the current Tsoknyi Rinpoche is connected to the nuns, they are able to receive teachings once again from their lineage teacher. Q: What’s important about supporting the nuns? Preserving the lineage and lifestyle of realized beings is extremely valuable. These Nuns flourish with inner qualities that are like gold or precious stones, created over a vast amount of time. Behind the great texts are the teachings of realized beings. The Dharma of the teachings has value, but the Dharma of realization is indispensable and difficult to develop. In Rinpoche’s words, “You can’t just print 100,000 copies of a realized nun—it takes 20, 30 or 40 years. It can only be created through long-term commitment.” Without underestimating the value of books, the wisdom of the Buddha can only be truly preserved through realization. Realization can only be embodied and nurtured through intensive practice. The nuns reach realization through understanding the nature of reality and embodying the Dharma. Supporting the nuns is important because doing so supports a lifeline of realization. Pundarika Foundation wants to ensure that this treasure is saved, and it is dedicated to preserving their way of life and meeting their basic needs, which are marginal, even by Tibetan standards. For example, virtually all of the 2,000+ nuns live without electricity, heat or running water, and in a very rugged climate with brutally cold winters. An analogy could be the wisdom of preserving rare and endangered plants in a rainforest that have the potential to heal and cure many people. The nuns are so dedicated to their prayers and practices that they spend all their time absorbed in them without interrupting their work schedule, and therefore their survival is tenuous. Despite the great hardships they have seen and continue to face, their willingness to endure remains strong, due to their love of Dharma. Q: How do the nuns benefit the world and us? Sprouting from their own inner qualities, the nuns are able to give insight, spiritual security, freedom from grief, release from sadness, happiness and blessings to others. They have the experiential wisdom to teach us how to transform ignorance and hatred into wisdom and love. They have an inner wealth that we can experience when we meet them personally or even by seeing the film. This quality can only be described as inspirational. Due to the difficulties they have endured, they can also show us how to live authentically and joyfully in the midst of hardship and loss. When Tibet exploded, the Dharma was brought out. Dharma is carried by people, not by books. It is in the human mind naturally, and these nuns who are practicing are bringing the benefit out. ‘Benefit’ is not just material—doing something, producing something, showing me something. Benefit or value is non-material. It is spirit, love, compassion, kindness. It is a human value, not a material value. Q: How do the nuns influence their immediate community? They actively help their families and villages through prayer, performing religious rituals, counseling, sharing resources when possible and sharing their practical skills in medicine, building and education. Because of the nuns’ example and active engagement, the villages and communities that surround the nunneries have been greatly influenced for the better, with violence, alcoholism and harsh speech becoming very rare. There has been a real improvement in the inner development of the community. Q: Why emphasize the support of female practitioners? There’s a great need for female practitioners. The experience of being with these women is very powerful. This power comes from the depth of compassion and the vastness of love that they embody. The sense of community and of mutual aid is very strong, despite the adverse political and cultural climate in which they live. Although women in many cultures are not respected, the nuns of the Tsoknyi Lineage have overcome these limitations through the power of perseverance and strong dedication to the Dharma. The expression of Dharma through the female form is an important and unique contribution. Qualities such as gentleness, motherly care and loving energy are so strong in the female form and very healing for the world. Q: Why do these women take on monastic life? Besides the draw of the Dharma and a spiritual life, young women also go to live at practice centers and hermitages in this culture to learn to read, gain protection from harsh outer circumstances and join a community of devoted practitioners. It is unusual for a nun to leave, and if they leave it is often due to family circumstances. Q: What happens if their tradition dies out? We, and the rest of the world, lose a precious source of spiritual qualities. Lives dedicated to practice must be allowed to flourish and help shape our collective global future. If this tradition dies out, a unique embodiment of living Dharma in female form will be lost. 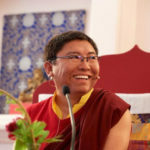 Q: How many nunneries is Tsoknyi Rinpoche responsible for? And why is he responsible? He is responsible for over 50 monasteries (nunneries) connected to the Tsoknyi Lineage in the Nangchen region of Eastern Tibet. During the Cultural Revolution, the nuns endured great hardship and began to regroup and rebuild their nunneries, stone by stone, and gradually others joined them. 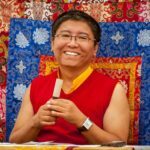 By the time Tsoknyi Rinpoche visited them in 2003 for the first time, he realized that through the efforts of the older nuns, the tradition had been kept alive and was taking root in a new generation. However, their living conditions were so difficult that he took on the responsibility of helping them survive. Q: What is the age range of the nuns? Their ages range from teenage to the mid- to late 60s and older. There is a gap between the ages of around 40 and 60 due to the destruction of the nunneries during the Cultural Revolution. About 40 nuns survived (out of thousands), living very primitively in caves or in nomad settlements. Many Nuns were forced to cities or back to their families to work the land and could not continuing practicing in a monastic setting. This is a good example of the fragility of the lineage. Q: What about medical facilities for the nuns? The nearest clinic to a monastery is minimally a full day’s drive by car (over difficult and at times impassable roads), or at least two days by horseback. Occasionally, there is a traveling clinic doctor, but this is not a reliable source of medical care since traveling clinics are seasonal and based on external aid agencies. Some areas have small Tibetan medicinal clinics. Q: What is the purpose of the film (Blessings)? Q: What kind of support is needed for the nuns? When the nuns are asked what help they need, it is bare bones—some tsampa (barley flour) and tea for food; cloth for robes; some light in the shrine; repair of buildings that are collapsing; and basic medical care for emergencies, infections and broken limbs. Most have been relying on family support in the traditional way. However, due to social and economic changes, the family support system is changing. Q: Is there a possibility that our aid to the nuns could potentially disturb the balance in their lives? Q: When was the film trip? The film trip took place in the summer of 2005. Q: Can we go to Nangchen and meet the nuns? It is an isolated area and very hard to get to. There is no extra housing and no provisions. At this time, traveling is not encouraged. We want to protect and preserve their environment, so they can continue to practice undisturbed. Q: What are the winters like and the elevation? The winters can get down to –40°F, and there is little or no infrastructure (roads, bridges, electricity, plumbing/waste removal, water or fuel availability). The nuns must carry water over long and icy distances, use yak dung to stay warm—and eat very simple food, often cold, to stay alive. When the snow melts in April and May, they are challenged by mudslides that block paths, roads and rivers, which can become impassable. Structures that are handmade of baked mud must be repaired and rebuilt. Due to extreme conditions much of the year, emergency health needs such as acute infections and accidents are either not treated at all or treated ineffectively. The average elevation is 12,000–14,000 feet.